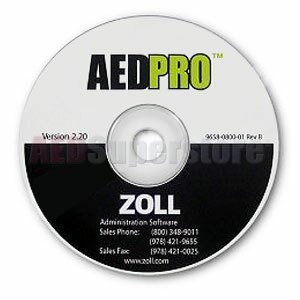 Use this CD to upgrade your ZOLL AED Pro to the AHA 2010 Guidelines! The AED Superstore® is now shipping the ZOLL AED Pro Administrative Software (ZAS) CD, which allow you to reconfigure and make the ZOLL AED Pro fully compliant with the AHA 2010 Guidelines! This CD REQUIRES that you use an infrared (IrDA) port (which allows your computer to communicate with the ZOLL AED Pro) to perform the reconfiguration/upgrade. If you don't already own an IrDA adapter(many laptops have them built in), you can purchase one from the AED Superstore by clicking here! XP, 2000, Vista, Windows 7, Windows 10.